Four members of the robbery gang, which unleashed terror on two commercial banks in the Ipakodo, Ikorodu area of Lagos two weeks ago, have been arrested by the police. Our correspondent learnt that the suspected robbers were arrested from Okitipupa, Ondo State, and Ikorodu, Lagos State, while three Sport Utility Vehicles allegedly bought from the proceeds of the robbery were recovered. The suspects’ names were given as Monday Akpan, Bright Agbojule, the third identified simply as Jafaru, and one Baba Ibeji. On Wednesday, June 24, the gang, which was reportedly led by a woman, had stormed the Ebute-Ipakodo branches of the First Bank and Zenith Bank at about 8.30am, and carted away millions of naira. The robbers, who overwhelmed policemen from the Ipakodo division, were said to have carted away about N60m from the Zenith Bank’s strong room, while N20m were stolen from the bank’s ATM room. The suspects, who dared policemen to confront them, later escaped in two speedboats at the Ipakodo jetty, Ikorodu. Four persons, including a bank customer, who were hit by bullets during the one-hour operation, were taken to the General Hospital, Ikorodu. 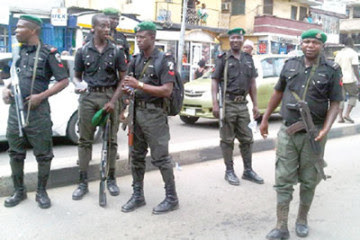 PUNCH Metro gathered that four members of the gang were arrested by men of the Special Anti-Robbery Squad, in an operation involving a former SARS commander, SP Abba Kyari, and an officer, DSP James Okeke. PUNCH Metro gathered that one of the suspected robbers, a week after the operation, had headed for the Okitipupa area, Ondo State, with a Lexus bought with the proceeds of the robbery. A police source told PUNCH Metro that the suspect was arrested by soldiers, who were on a stop-and-search exercise in Ondo State. It was learnt that the suspect was also found with bundles of new N1,000 notes with bank seals. The police source said the arrest was the break that the police needed, adding that the suspect later led policemen to arrest other members of the gang. He said, “The soldiers were on a stop-and-search and they found the suspect, identified only as Baba Ibeji, while on his way to his home town in Okitipupa, Ondo State. “During a search, they found bundles of new N1,000 notes with bank seals in his bag. “The soldiers, who were also aware of the bank robbery in Lagos, smelt a rat and contacted the Lagos State Police Command on the development. “The former CP, Kayode Aderanti, immediately contacted experienced hands in SARS for the interview of the suspect. The suspect gave the contacts and names of other suspects. The operatives subsequently mobilised more officers to Ikorodu and made some arrests. Our correspondent learnt that the suspects would be paraded on Monday (today) at the state command headquarters, Ikeja. It was learnt that efforts were still being intensified to get other members of the gang, which reportedly numbered about 15. The Lagos State Police Public Relations Officer, DSP Kenneth Nwosu, confirmed the arrests in a text message.